"I received the English books (in addition to the Kreyol) on Friday in Haiti and my kids took some to school to read with their classes. They look great! Thanks again. " 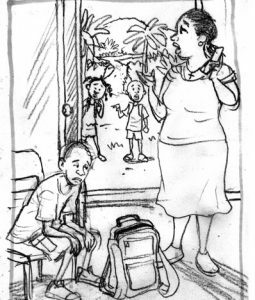 Viktwa Mackenson Sou Maladi Dyabet or Mackenson Triumphs Over Diabetes, a 20-page coloring book, presents diabetes education in story format, with Kreyol text and culturally correct illustrations authentic to Haiti. The main character, 12-year-old Mackenson Phildor, suffers with undiagnosed diabetes in Haiti while his mother tries to help. The actual Mackenson, now a young adult, co-authored the book through his perspective and memory of that time. The Kay Mackenson staff and team of doctors also provided input to show the full perspective of experiences. Mackenson narrates a description of his journey by describing what his life in Haiti was like with symptoms of diabetes. He tells how his mother seeks help from within the community by trying various cultural approaches to healing; his eventual hospital visit; insulin administration and the ultimate triumph in discovering the ongoing care and education at the Kay Mackenson clinic. Now he helps other Haitian children struggling with diabetes-related issues. Dr. Ric Bonnell met Jean Mackay Vinson, JAMSBooks Founder, and her husband Dr. Steve Vinson at the Children’s Hospital of the King’s Daughters’s Global Pediatrics Meeting in Williamsburg, Virginia in 2014. He purchased some existing hygiene books designed for Haiti at the conference which later proved effective in Haiti. Having learned about the customized design, illustration and publishing process JAMSBooks provides, he later contacted Jean to ask more questions and the creation process soon followed. Using actual pictures of Mackenson and the details of his story, JAMSBooks illustrated him as the main character. In his own words, Mackenson tells his story. Now, children throughout Haiti benefit from hearing it and learning how the resources at Kay Mackenson can help them, their friends and family as well. 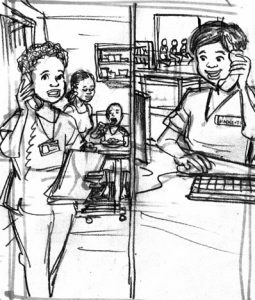 In addition, the Haitian nurses as the clinic took part in collaborating with the creation of the book, helping describe scenarios from their cultural perspective; advising about what to depict and how to show it. The nurses gave feedback about illustrations and the translation terminology. The actual nurses who now serve at Kay Mackenson were illustrated into the book. 12-year-old Mackenson Phildor developed Type 1 Diabetes in 2012 while living at an orphanage in Montrouis, Haiti. Missionary and local healthcare providers realized that there wasn’t a suitable medical facility to provide care for him and other children with similar diseases. Kay Mackenson clinic was created later that year in his honor and has since positively transformed the lives of many Haitian children. Now, Kay Mackenson provides comprehensive medical care to disadvantaged Haitian children suffering from diabetes and other chronic, non-communicable diseases. 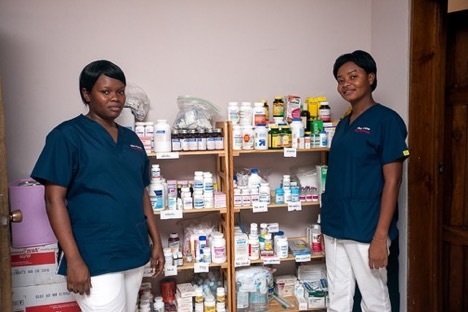 The group aims to be a pioneer in Haitian medical excellence by greatly expanding access to compassionate and affordable health care services for children in need. The team relies on trust, respect and dignity. These values reflect their strong belief that each child, regardless of income, status or location, deserves an equal opportunity for health and happiness. Kay Mackenson Clinic was founded in 2012 when the Carpenters/Dickeys and the Bonnells met in Haiti. Dr. Ric Bonnell and his wife Wendy, both pediatricians involved with relief efforts in Haiti for years, were in the process of adopting their son Mackenson when he developed diabetes in August 2012. Ric, then in the US, immediately flew to Haiti to provide his son with insulin, monitors, assorted diabetes supplies and education on how to effectively manage his illness. Through this experience, the Bonnells realized that they had never before encountered another child with diabetes in Haiti. During the same week, Dr. Chris Carpenter, also a pediatrician, and his wife Lisa Dickey, a public health expert, were involved in the care of Walencia, a teenage girl with newly diagnosed diabetes who they had moved from the hospital where they worked into their apartment so that she could receive appropriate care. 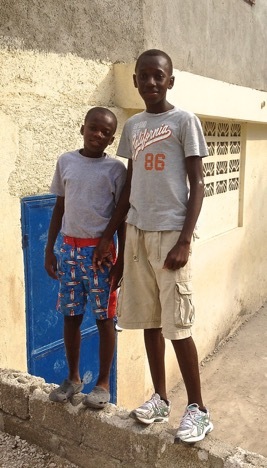 Given these two coincidental stories obviating the lack of health care facilities for children with diabetes and other chronic diseases in Haiti, Chris and Ric devised a plan to start Kay Mackenson (KM) as a new center for pediatric chronic diseases. Just six months after Mackenson’s diagnosis, KM welcomed its first patients. Mackenson’s story continues on in “Viktwa Mackenson Sou Maladi Dyabet” Mackenson Triumphs Over Diabetes” published by JAMSBooks in partnership with Dr. Bonnell and the team at Kay Mackenson. In August, 2016 Mackenson leads a camp in Haiti, using his own books to help educate his fellow young Haitians.